The second film, A Walk through the Tunnel, shows Jim Leary, Fieldwork Director of the project for English Heritage, talking about, “…a few of the discoveries made inside the tunnel.” The film concludes with a, “…walk along the main tunnel from its start at the surface of Silbury three to its end at the central core of Silbury one”. Note how the number of small boulders on the tunnel floor increase towards the central core. The third film, Collapse and Discoveries, shows engineers led by Mark Kirkbride (Project Manager from Skanska) discussing problems, and some of the archaeology revealed by a collapse inside Silbury, with Amanda Chadburn from English Heritage. Chadburn’s statement with regard to a collapse that, “If we just leave this it will eventually migrate up to the surface we’ll end up with Silbury with a kind of little valley or something [gestures]… which is not good…” is a little understated to say the least. The fourth film, Filling the Silbury Hill Tunnel, begins with the somewhat premature claim that, “…the Hill has been stabilised and the future of this important monument assured.” Note there is no mention of the sensors still monitoring the interior, nor the possible deleterious effect foreign bodies in the form of iron arches and plastic sacking within the Monument might have on it. In the film English Heritage also glosses over their idea for a time capsule by saying, “During the project English Heritage involved local schools in a number of projects…” One such project was, in fact, for a time capsule containing, among other things, items made by local schoolchildren which would have then been placed within the Monument. 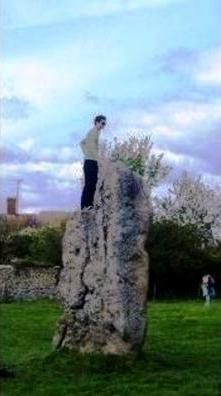 The idea was opposed by Lord Avebury (owner of Silbury), by Heritage Action and by others and was eventually abandoned. The film opens with a pagan ceremony followed by Mark Kirkbride and Jim Leary describing the final days of engineering and archeological work at Silbury. The film concludes with an advertisement for Jim Leary and David Field’s forthcoming book (foreword by David Attenborough***) The Story of Silbury Hill. Putting aside the slow release of the films, together and in this format, the lack of detail contained within them, and what looks like a sleight of hand re: the editing out of the opening of the Atkinson/BBC tunnel door; not to mention the somewhat premature claim that, “…the Hill has been stabilised and the future of this important monument assured.” there is much food for thought contained within all four films and especially the last one where it is revealed that various stages of the construction of Silbury are far more complex than hitherto thought. After watching the films I am yet again struck by the beauty and sheer complexity of Silbury, both as a structure and as a monument (I wish English Heritage would stop calling it a hill) and deeply saddened by all it has suffered in recent times. 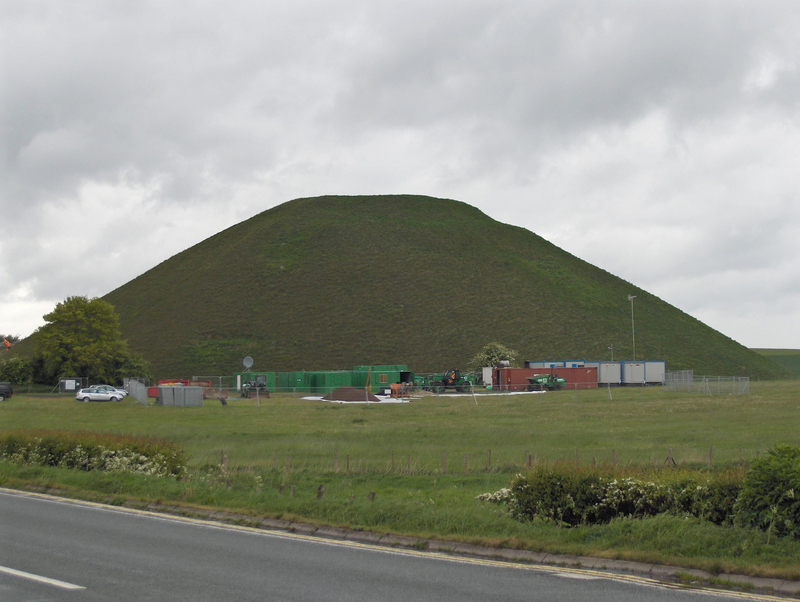 Let’s hope that English Heritage’s claim that, “…the Hill has been stabilised…” holds true. Littlestone. Heritage Action Site Inspector. ** Seen here – http://www.youtube.com/watch?v=LxkXdK2hcs4 (04:40 minutes in). It’s difficult to reconcile that footage with what seems to be a ‘cleaned up’ version of the opening here – http://www.english-heritage.org.uk/about/multimedia-library/conservation-projects/ (Holes in The Hill: The Conservation Project Begins. 03:00 minutes in). Perhaps English Heritage would like to explain the difference? *** David Attenborough was Controller of BBC2 when the Silbury Dig programme was filmed for the channel in 1968 and 1969. Silbury Dig was one of several programmes in BBC2′s Chronicle series. It seems the young, and perhaps overly enthusiastic, controller invited Richard Atkinson to tunnel into Silbury and ‘reveal its mysteries’ to the nation on television. Let’s hope that David Attenborough uses the forward to this book to state clearly that the Silbury Dig programme should never have been made, that it was a shambles from beginning to end (the tunnel was not even backfilled after Atkinson and the television crews left) and that it went against the accepted conservation (and probably archaeological) standards of the time. Interesting art exhibition opening on the 31st July till 18th September at the Gwynedd Museum and Art Gallery in Bangor. It features the work of Mary Lloyd Jones….. “renowned for her use of colour, line and ancient writing, Mary expresses her interest in ancient archaeological landscapes. Her paintings respond to many visits to these sites such as Bryn Celli Ddu, Moel Fenlli and Caer Drewyn.” Rock art and Viking runes seem to be a feature of her work. Also running concurrently with the above exhibition is another…. “A special project which explores the hillforts of the Clwydian Range, with excavations by Bangor University. Archaeological drawings, aerial photographs and paintings by Bill Kneale interpret this remarkable landscape”. Straitened times for the archaeologists? The two organisations, both of which are charities, will be undertaking a process of due diligence over the coming months and anticipate announcing the result of that in the autumn. I was recently intrigued to see a new booklet announced by Seven Stones Publishing: ‘The Stone Circles, Standing Stones and Chambered Tombs of West Penwith‘ and so promptly ordered a copy, along with ‘The Lost Stone Circles of Shropshire‘ by the same publisher. West Penwith (the ‘toe’ of Cornwall) is an area that I’m privileged to know quite well as far as the ancient monuments of the area go, having spent multiple stone -hunting holidays there every year for the past 9 years or so. Any new book on the area therefore immediately grabs my attention lest it can impart any new information. Shropshire, on the other hand is an area I know very little about, archaeologically. Both paperback booklets (at 26 and 30 pages respectively, they can hardly be called books) follow a similar format. Brief introductory essays on the development of the monument types under scrutiny, then a more local overview of the prehistoric landscape of the area in question. Finally, gazetteer sections list the monuments by type. The Penwith volume includes some coloured photos, the Shropshire one is B/W only. Each site entry gives OS co-ordinates, a brief description of the monument and any known folklore or historical notes about the monument. Each booklet includes a brief bibliography. I was somewhat disappointed with the line illustration on the fly pages of the Penwith booklet; a stylised stone circle with a campfire fully ablaze in the centre, watched by an owl and a hare. A lovely, evocative image, but I’ve seen enough illegal firepits at ancient sites to know the damage they can do. Illustrations like this can only encourage what is an insidious and I repeat, illegal practice. I would hope the illustration could be amended for any subsequent reprints, and will draw the author’s attention to this review. The list of sites in Penwith is reasonably comprehensive, but I note that both Brane and Tregeseal Entrance Graves have been omitted from the listings. These minor omissions will apparently be corrected in the next reprint. I cannot yet comment on the range of sites in the Shropshire volume but the author assures me all possible sources have been scoured. I hope to put the information given to good use over the next few months, when I hope to visit the area for the first time. The booklets could be improved by closer attention at the proof-reading stage. My (possibly pedantic) eyes jarred several times at incorrect punctuation and grammar (e.g. there/their). But that said, the books should prove a useful starting point for anyone wishing to explore either of the two areas. A companion volume, Stone Circles of the Peak District is apparently forthcoming. Lanyon Quoit in West Penwith is one of the staple tourist symbols of Cornwall, and at the time of writing has appeared as the Heritage Action Wallpaper image more times than any other site. Lanyon Quoit, also known as The Giant’s Table, dates back to the Neolithic period (3500-2500BC), predating both the pyramids in Egypt and metal tools. It looks very different today from how it originally was constructed. It is thought that a great mound of earth would have covered the monument as a long barrow some 90 ft long and 40 ft wide, and indeed today traces of the original shape of the mound can just about be discerned on the ground. However, the biggest change is in the height of the 9 feet by 17 feet capstone which weighs some 13.5 tonnes. William Borlase, writing in 1769 recounts that, at that time, it was possible for a horse and rider to pass under the capstone. In 1815 a great storm brought the monument crashing to the ground, and one of the uprights was broken. The collapse was attributed in part to soil removal from numerous treasure hunting explorations, including a six feet deep pit dug in the mid 1700’s which uncovered a grave (details now lost) – just as well that today such excavations, and even metal detecting on scheduled monuments are strictly illegal! Within nine years the local inhabitants had raised enough money for a re-erection, and in 1824 this was achieved by a Captain Giddy R.N. and his team. Unfortunately, the restoration is said to have been somewhat ‘botched’ as part of the capstone was broken off, and the three remaining uprights were squared off, leaving the monument as it is seen today with the capstone only some 6 feet off the ground, and looking slightly unbalanced. In addition, the reconstruction was completed at a 90 degree angle to the original layout. The date of the restoration, 1824 can just be seen (in the right light) etched into one of the uprights. There are remains of several stone cists in the immediate area. 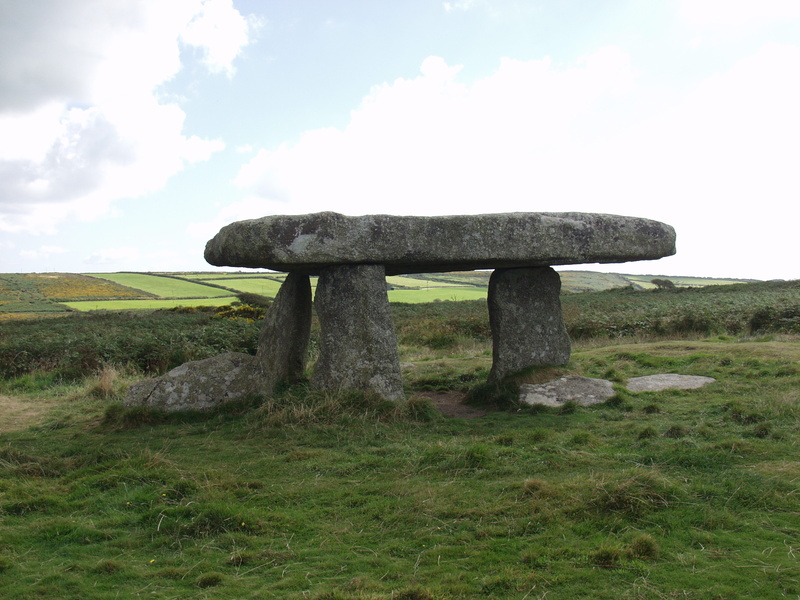 The monument, and the land surrounding it, was given to the National Trust in 1952 by Edward Bolitho of Trengwainton, and stands alongside the main road between Penzance and the north Penwith coast, making it one of the most accessible and frequently visited of West Penwith’s prehistoric monuments. Above and following, some of the detritus removed from Silbury during English Heritage’s ‘conservation project’ of the monument between 2007-2008. 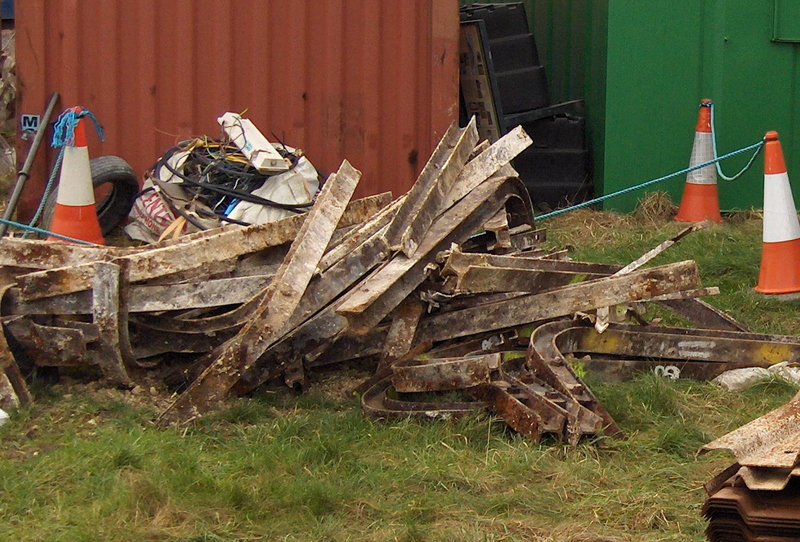 Detritus, more of which sadly still lies within the monument along with other 20th and 21st century ‘additions’. Will it ever be possible to look upon this ancient site with impartial eyes, knowing what modern rubbish now lies within – rubbish in the form of thousands of plastic sacks, metal tunnel struts and sensors? Well, perhaps not, but thanks to Heritage Action and concerned individuals elsewhere, the monument does not, at least, now harbour a time capsule (an idea promoted by English Heritage and supported by others who should have known better) and an idea which, by extension would have lead to the monument being re-opened at some time in the future thereby contradicting English Heritage’s assertion that the monument would never again be opened! Runs no stern whisper through the narrow vault? With backward beckoning arm? No, all is still. Green Pyramid of the plains, from far-ebbed Time! Or where the peasant treads the Churchward path. After some 160 years Emmeline Fisher’s poem, with its apology to our forefathers who built Silbury, stands as the only half-decent thing ever to have been placed within the structure by modern hands. Thankfully, even Emmie’s poem is no longer there, though sadly many of the Atkinson/BBC’s corroding iron tunnel work struts of the late 1960s (not to mention English Heritage’s thousands of plastic sacks of the early 21st century) still are. Next Summer, to mark the 200th anniversary of Constable’s arrival in Salisbury, the city’s museum will stage the Constable & Salisbury Exhibition which will see a multi-million pound collection brought together from both private owners and major art museums. Of particular significance will be the opportunity to see one of his most famous works, his depiction of Stonehenge. 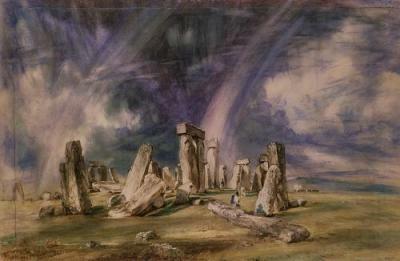 Constable visited Stonehenge in 1820 where he made a sketch that was eventually worked up into this famous watercolour for his last exhibition at the Royal Academy in 1836. “The mysterious monument… standing remote on a bare and boundless heath, as much unconnected with the events of the past as it is with the uses of the present, carries you back beyond all historical records into the obscurity of a totally unknown period’. 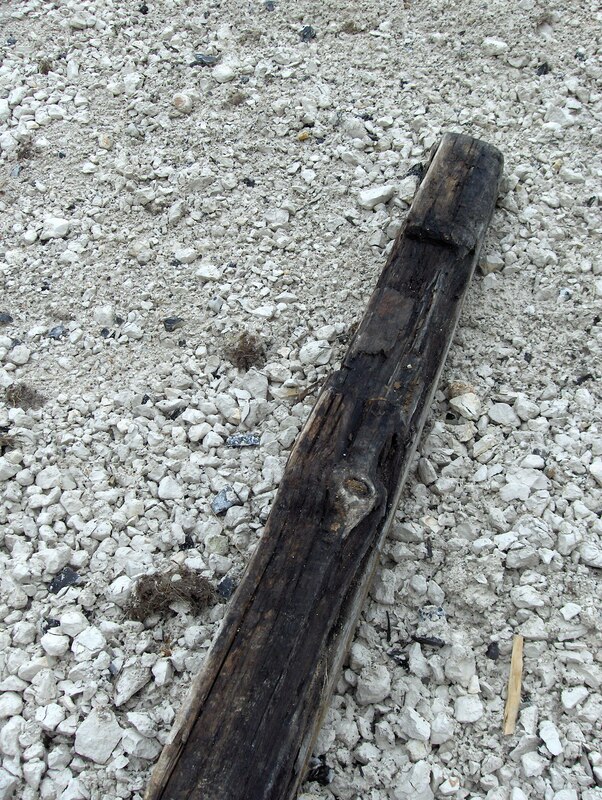 Stonehenge had a previously unknown wooden “twin” just 900m to its north-west, according to remarkable new archaeological investigations. In a last ditch attempt to save Silbury from collapse, English Heritage undertook a ‘conservation’ project during 2007-2008 to stabilise the structure and remove the detritus of previous tunnelling. Sadly, not only has much of this detritus been left within the structure, but parts of the original monument (eg the sarsen stones pictured below) seem not to have been returned to their original position within Silbury Hill. The present location of these stones, the meaning of which has attracted some speculation, remains unknown. 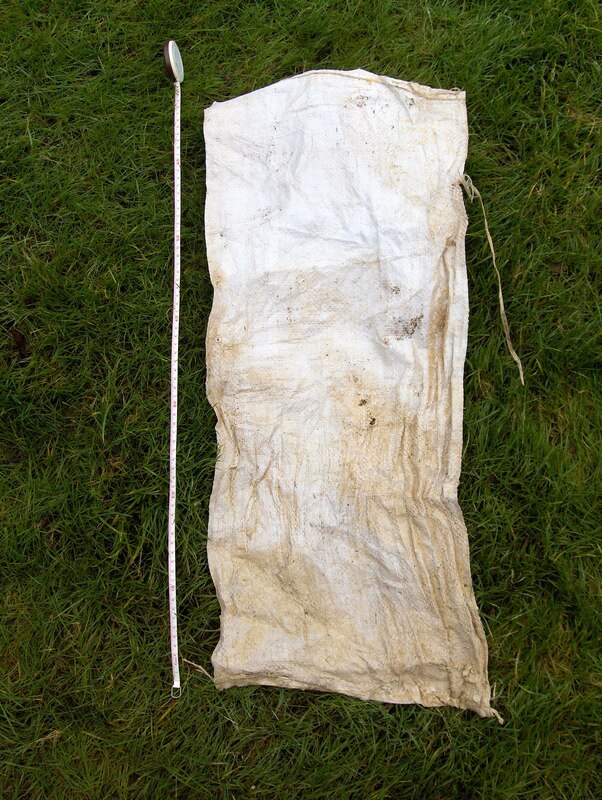 If that were not bad enough, English Heritage has introduced even more detritus into the monument in the form of thousands of plastic sacks filled with chalk rubble; these sacks were used to form partitions within the Atikinson/BBC tunnel so that the area behind each partition could be backfilled with a chalk slurry. One is force to ask why plastic sacking was used instead of blocks of chalk closer in composition to the mound itself. We have no idea at present how long the life span of these sacks is nor whether they pose any long-term hazard to the monument as they break down. 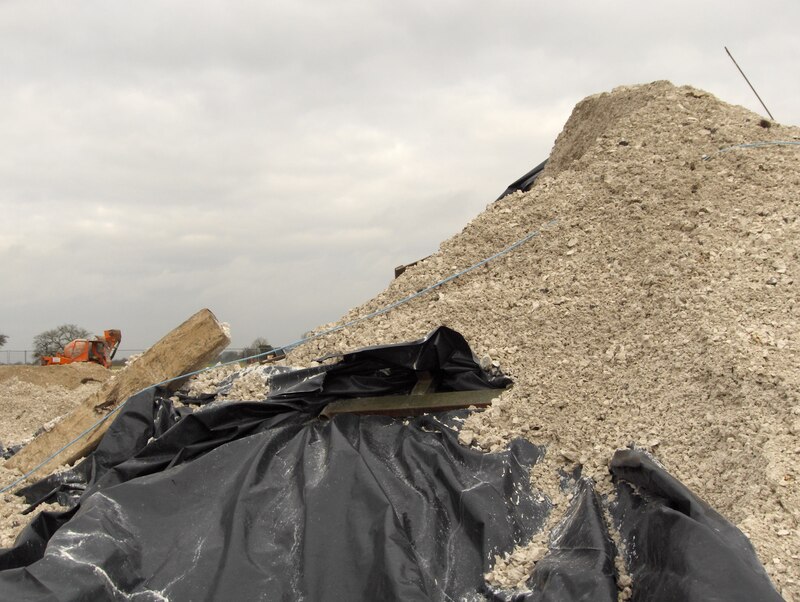 Perhaps English Heritage would care to comment here on their decision to use plastic sacking rather than chalk blocks – a decision which seems so at odds with accepted conservation principles. So – where are we? Are we now allowed to go climbing up Silbury and clamber all over Stonehenge? Excellent! Now I can sate my desire to sit and/or stand on things! Not really. I don’t understand the mentality of the desire to climb things. Is it because you’re not supposed to? Is it like sticking 2 fingers up at the guardians of the site that request that you don’t do it? A sort of “Hey, man – these things belong to *all* of us, therefore I’m going to help myself!”? "Hey, the stones are everyone's maaan so I'm entitled!" If it *were* only one person doing it, once, then the damage would probably be non-existent. But if you multiply that by the amount of visitors to these places each year, then of course “wear and tear” will occur! I use that phrase lightly, but if you look at the visitor numbers for Stonehenge and Silbury, and imagine every single one of those people wanting to climb, I don’t think you need to be *that* clever to work out that it’ll cause damage! St Catherine’s Hill, in Winchester – a gorgeous hillfort with a mizmaze at the top (and, sadly, the M3 motorway gouged through the adjoining hill, but that’s another thread, I guess!) – has so many visitors that, after decades/centuries, a path was formed by god knows how many people using the same route. 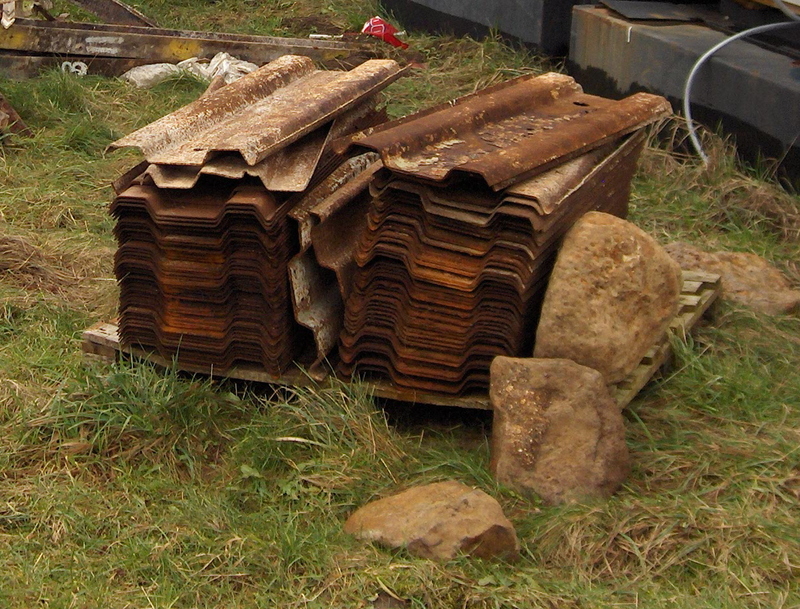 The corrosion became so bad that a wooden stairway was constructed up the side! It has the benefit of conserving the rest of the hill, but it’s not really that attractive. Silbury, with a million (is that a fair estimate? Totally plucked from nowhere so may be well off!) visitors a year, would soon become criss-crossed with paths and worn areas if everyone decided they wanted to climb up! And Stonehenge – although the stones are, as is the nature of stone, quite hard, surely you’ve seen the effect of decades/centuries of wear and tear on stone? Go visit a castle or summat and have a look at any original stairway or other much-used surface area. So *well done* and a pat on the head to those that *have* climbed the hill/stones. Have a biscuit.